In the last week there has been a lot of attention given to recent political and Supreme Court decisions in the United States. Supporters and protestors conspicuously rally around flags that symbolize their values. This is the Christian Flag and it symbolizes values that are central to me. 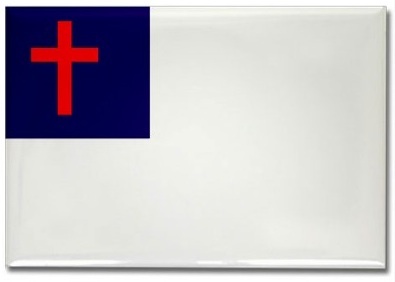 The Christian Flag was first conceived on September 26, 1987 at Brighton Chapel, Brooklyn, New York. Sunday school superintendent, Charles Overton gave an impromptu speech when a scheduled speaker failed to arrive. He asked the students what a flag representing Christianity would look like. Years later after contemplating the responses, he and a colleague designed and began promoting the flag. The following explanation was given for the symbolism. The flag has a white field, with a red Latin cross inside a blue canton. The shade of red on the cross symbolizes the blood that Jesus shed. The blue represents the waters of baptism and the hope of heaven. The white represents the purity of Jesus. The white flag is linked to his surrender to God. Some later have suggested the white flag represents his nonviolence, like waving a white flag. Flags were used in the Old Testament. Moses put up a banner (flag) and declared God: Jehovah Nissi; “The Lord is My Banner” (Exodus 17:15). God was the one Moses and the children of Israel would rally around. The banner was a proclamation that made a strong statement about who was their God. Sometimes the flag was used in worship and at times for warfare. Most of all it would represent God’s presence in their midst. Just as the Royal Standard flag flies at Buckingham palace to signify that the Queen is in residence. Flags were not used in the New Testament. Jesus never waved a flag, nor is there evidence of flags used among early Christians. Some use flags in worship services today, like with a song or a dance; they can add beautiful expression and meaning. Flags drape coffins of fallen soldiers and they honor soldiers. There are strict orders for their use. Each fold of the flag has meaning. Flags flown at half-mast have special significance and command a response of respect and honor. So what should our response be to the flag controversy? Is it necessary to for us to fly the “Christian Flag”? I’m sure this post will be met with various opinions. I personally do not need a Christian flag to fortify my faith any more than wearing a cross might. However the symbolism is rich in meaning and I should stand with those who do. I’m especially grateful for the symbolism of the cross and what it means to me. In Song of Solomon 2:4, the bride sings about God’s love for us with the words, “His banner over me is love.” The cross symbolizes the death that brought redemption and reconciliation through Jesus; it our rally point, our proclamation, and an assurance of His presence in our midst. It is ‘our’ banner of love. We know that people will rally around many kinds of flags. In Europe fans rally around and wave flags of their favorite football team. Family shields are made to symbolize one’s heritage. People wear hats and shirts that represent their loyalty and commitment. They intentionally want to be conspicuous. As flags are conspicuous, it would be great if our love, peace and joy would be conspicuous. People want their flag to attract attention and stand out. Waving a flag can mean nothing, but our worship, love, peace, grace and joy can mean everything. Let’s not be critical of the flags that others wave. Let’s trust that all the cross represents in us will be what really matters, and like the song above declares, ‘the whole world will come to know’ and even sing “His banner over me is love”. I hope your love and life are conspicuous. What is the most conspicuous thing about you? What would others say? “They’ll know we are Christians by our love” (John 13:35 paraphrase).